Broadsheet until 1942, then an oversized tabloid. The amalgamation of several of Melbourne's first colonial newspapers, including the The Port Phillip Patriot and Melbourne Advertiser. In this sense, The Argus was Melbourne's first newspaper. A popular Melbourne newspaper renowned for its authoritative coverage of politics and social issues. For Melbourne readers trying to find the middle ground between the conservatism of The Age and the sensationalism of The Sun, The Argus provided the perfect compromise. Ran classified advertisements on its front page until 1937, but had a good pictorial content within its pages throughout the 1920s and 1930s, frequently running extensive photographs of social, sporting and other activities in and around Melbourne. One of the first Melbourne newspapers to include a dedicated Women's Supplement. Coverage of World War II was second to none, with its front page featuring up to date reports, photographs and maps detailing the latest offensives. At the height of the war in 1942, it changed its size to a tabloid as this was better suited to the austerity of the period. 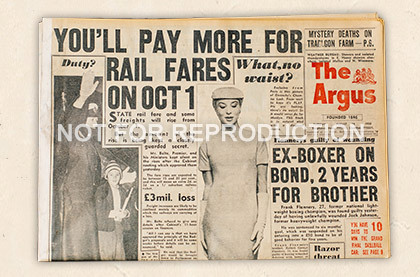 Again rejuvenated in 1950 by its new owners, the UK's Daily Mirror, to become a more lively enlarged tabloid. In 1952, it became the first newspaper in the world to use colour printing and photography in occasional issues, and it soon became known as one of Australia's most progressive newspapers, dearly loved by it's Melbourne readers and staff. Became unprofitable in the late 1950s and its owners shut down its presses in 1957.